Make meetings easy and productive. A shared virtual meeting space for every meeting keeps all the team’s information in one place, easy for everyone to access. 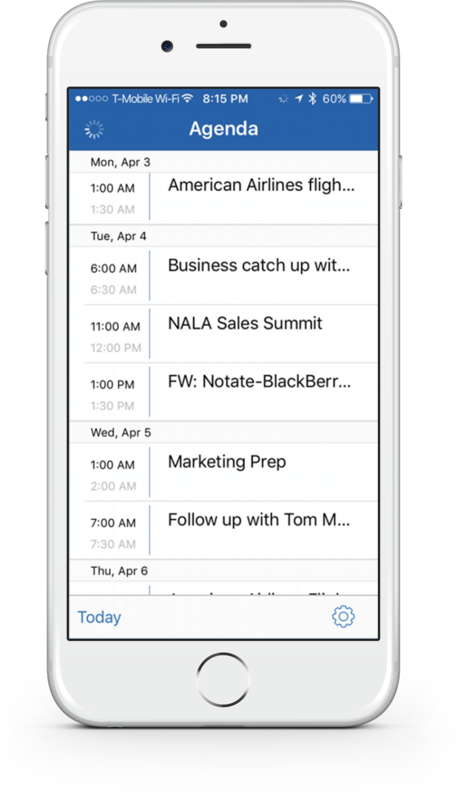 Navigate Outlook meeting schedule by agenda view. Take meeting notes. Near real time sharing. Take action items and assign them to attendees. Action items and notes are synced with Outlook. 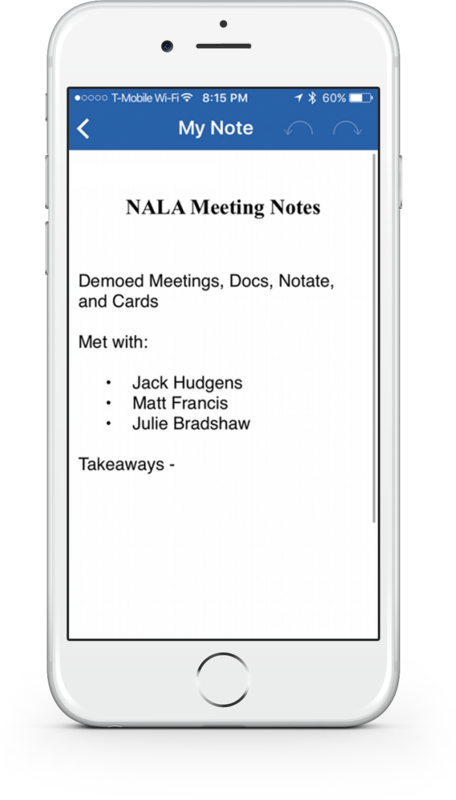 Integrated with Notate, so users can manage and complete their assigned action item. 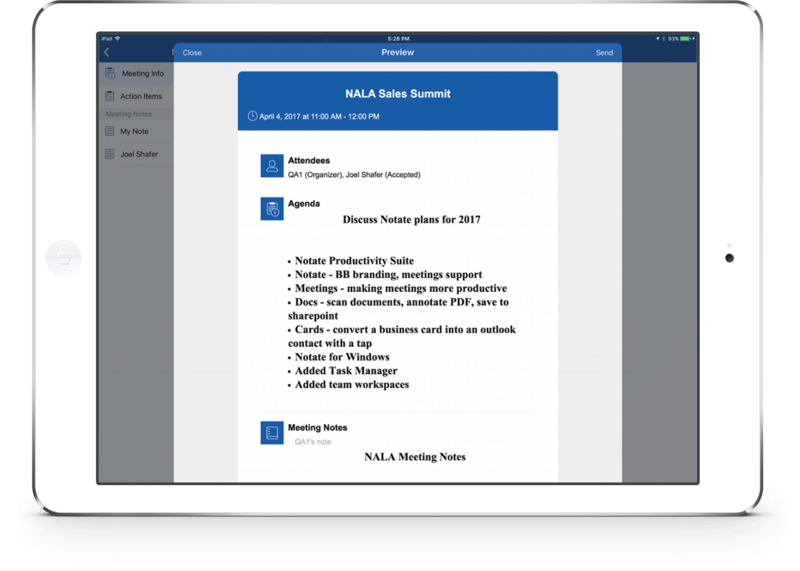 Notate Meetings is part of the 4-app Productivity Suite. Shared meeting space where users can see the agenda and make notes prior to the meeting, to help the meeting be more productive. Everyone can take notes in the shared meeting space. Anyone can add action items and assign them to attendees. Syncs with Outlook – delegated tasks show up as to-do items. Create and assign Action Items Syncs with Outlook. Share meeting notes with attendees. Follow up on past action items and see what still needs to be done. Easily see the notes and action items from the last recurring meeting. Support for recurring meetings makes it easy to check last week’s meeting results with a single tap. Email meeting minutes with a single tap. 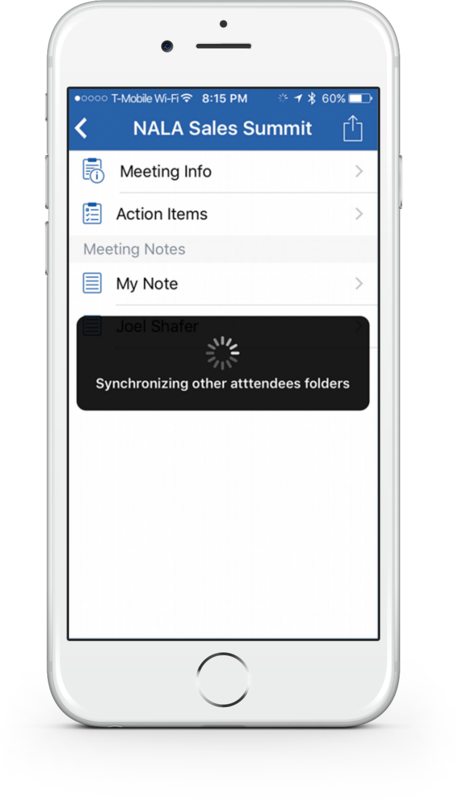 Meetings integrates with Outlook and Notate so attendees can easily follow up on assigned action items, and completed action items will be reflected in the Meetings app. When you assign an action item to someone, they will get an email letting them know about the item, and if they are a Meetings user, they will also see the action item in their Outlook or Notate to-do list. With just a tap, at the end of the meeting, all the meeting information including attendees, agenda, notes, and action items will automatically be emailed to all meeting attendees. A shared meeting space increases productivity by helping workers prepare before the meeting, and to follow up with results after the meeting. With Meetings all your information remains secured within your own network. No additional servers are required. Meeting data is secured with FIPS-certified encryption. No note data ever resides in the cloud and is instead synced and backed up via a secure tunnel to the corporate Exchange server. Meetings helps busy Professionals organize important meetings, improve team productivity and information sharing.